CFOs are in a unique position to lead their company throughout the IPO Execution Process, and they need to tackle the necessary tasks required for IPO success—the five steps below—to ensure finance can act like a public company before becoming a public company. 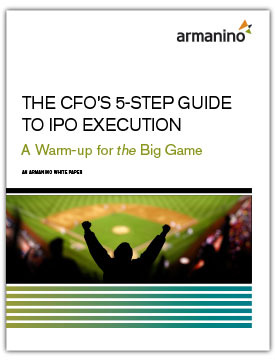 The CFO’s 5-Step Guide to IPO Execution – You’re Already Behind! When a company is planning an IPO, CFOs shouldn’t have to navigate the IPO Execution Process alone. Armanino’s IPO Readiness Team has the expertise in technical accounting, systems evaluations, tax and internal controls needed to ensure you and your team are ready—when the time is right—to take your company public.